I will never eat this again and not remember a…touchy conversation over lunch with my family. 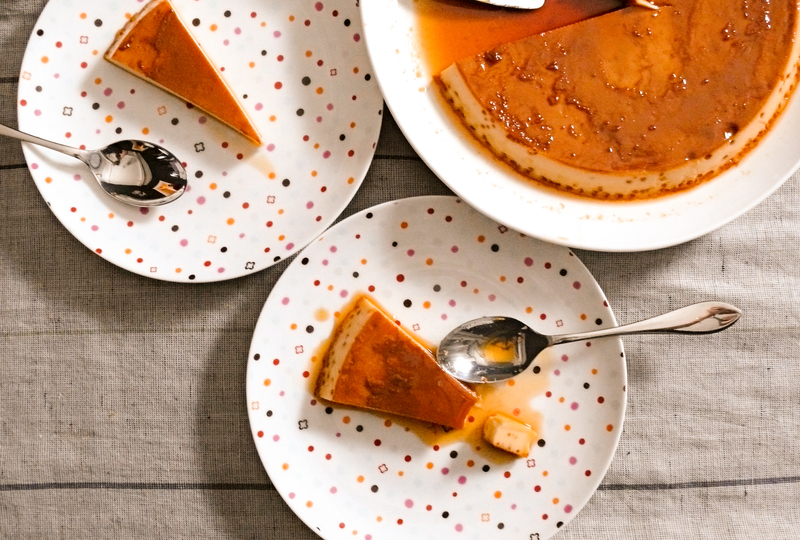 A few weeks before the lunch, I’d called my mother to ask her to share her recipe for caramel flan. She couldn’t believe my timing. She’d just found a tiny scrap of paper on which her mother had hand-written that very recipe. I couldn’t believe my luck. My grandmother, whom I miss and whose cooking cannot be matched. Her recipe. It was meant to be. I asked my parents and my aunt to come over for lunch; after, we’d make the flan together. I was looking forward to this precious, memorable afternoon. My mom pulled out the recipe over lunch and handed it to my aunt. Look at mummy’s handwriting. So delicate even when scribbling down a recipe. I peeked over my aunt’s shoulder to look at this scrap of paper for the first time, my eyes narrowed and just as I was thinking it, my aunt said it: This isn’t mummy’s handwriting! My mom wasn’t having it. What! It is! No! This is not mummy’s handwriting, Akki (big sister)! My mom actually snatched the recipe back. It is! And the debate volleyed between them for at least 3 more minutes. I ate. I said something, casually, through a mouthful of food. That’s not Nana’s handwriting. Now my mom started to doubt. Eh…!? My dad, enjoying his lunch, barely listening, finally plucked the controversial paper from it’s neutral position on the table to look it over. This is MY handwriting. My sister mailed me this recipe when we came here… (to Canada, which they say as if it was 40 days, not 40 years, ago) …I copied it from her letter. My aunt was right. See?! My dad continued… I asked her to send her recipes to me then, all the time. See, I wrote the date on the back. April 1973! Oh I remember I was working nights in those days, this was when we lived in the apartment… …and was floating into a story about how hard he worked and how bad the winters were. My aunt went back to eating but I’d stopped—kind of bummed. I mean, so wait, this was NOT Nana’s recipe? My mom ate but had not moved on. She waited for my dad to finish and then commented on the paper, not his story. Well you had nice handwriting. Back then. My aunt won, my dad lost. 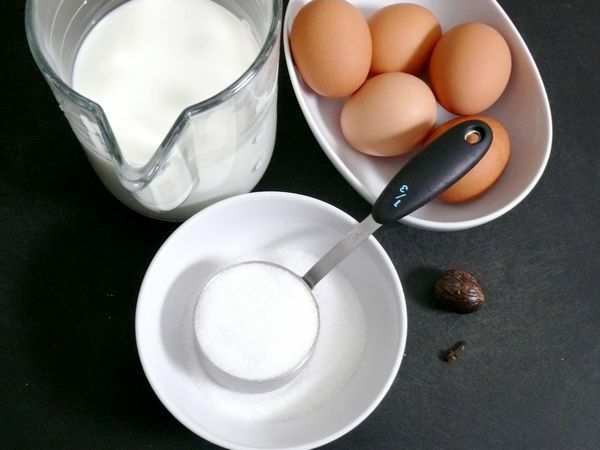 This is still a great family recipe so I come out ahead, regardless. Never mind the arguments that ensued in the kitchen over the definition of puddings versus custards versus flans, whether to heat the milk or add it cold–my dad never heated it, my grandmother always did. We figured out when you would and wouldn’t, to our satisfaction: it was decided that if you’re using condensed milk as you often would “back home”, you wouldn’t heat it. Controversy aside, this is an utterly simple recipe, maybe a hybrid of my aunt in Sri Lanka’s recipe and my grandmother’s method. It was delicious and provided comfort. No one argued while enjoying a late afternoon dessert. Great story Yas! Pass along my regards to your family! Happy Holidays. Great post, thank you for sharing the story! My mom makes a leche flan esp. in occasions, but i think she would make a yummy caramel too! thank you. 🙂 and you should make it for her–its so easy, i swear! the leche flan sounds amazing. Lovely post.. I love caramel anything! Such a wonderful post 🙂 and this caramel flan looks amazing!!! thank you! and yes, its so easy. if you try it, please let me know! Aw, thanks, Alicia! And Im with you re. caramel. Burnt sugar–whats not to like, right?? I loved that beginning story! It’s usually how get-togethers end up at my family’s house! The flan looks like it turned out beautifully! Aw, thanks. I hope the flan turns out well! This is very delicious! I just tried it and I am so amazed with it! I want to have desserts like this everyday.